indeed it has been known as one of the trading methods that allows traders to trade more convincingly. There are various options for the end of time to conduct short-term trading as a strategy that is not only done spontaneously, but also implemented more planned. This allows traders to trade in 5 minutes, or even 1 minute to find out the desired benefits. But if the expiration time is called risky, there are still limited strategies for other binary options that can bring safer profits. Trading with a 15-minute expiration time is an intermediate advantage for traders who want to make a profit in a short time, but are hesitant to use an expiration time that is too low. Here, a 15-minute binary options trading strategy will give you the option to trade perfectly without having to worry about noise that often occurs at a lower time frame. Technically, there are 2 ways of trading that can help you to implement a 15 minute binary options strategy. This article will describe how these two methods can show trading opportunities from the binary options 15 minute strategy. Observations on candlestick patterns can be one of the simplest trading methods, because you don't need to install any indicators. Given the large number of traders who rely on the use of candlestick charts, the observation strategy on candlestick patterns is now growing and is widely applied in naked trading. Basically, there are candlestick forms that can be used as a marker of price movements as well as a reversal or trend forwarding indicator. 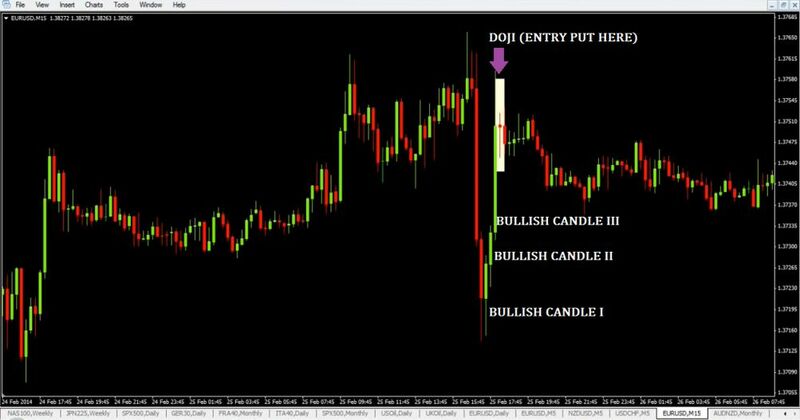 For example, a candlestick in the form of a doji signifies market uncertainty because its very short candlestick shape indicates that the price is opened and closed at almost the same level. Meanwhile, the hammer and hanging man pattern indicates a reversal, because it has a lower shadow that is longer than the body of the candle. Such a candlestick shape shows seller pressure to make a reversal of the current trend. To place the "call" option, 3 bearish candlesticks with a lower low pattern are needed. To place the "put" option, it takes 3 bullish candlesticks that illustrate the higher high pattern. In the picture above, trading EUR / USD conducted at a 15-minute time frame also relies on the revesal strategy in its application. Thus, the doji pattern formed after 3 candlesticks with a higher high pattern can be said to be a bearish reversal marker. This can be seen from the fifth candlestick formed after the doji. 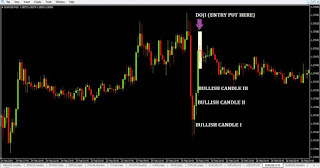 The candlestick closes at a price lower than the previous doji candlestick, so that the binary options position placed with the "put" option will end in-the-money within 15 minutes. Even though the ideal number on the doji's precursor candlestick is 3, this number can vary according to the strength of the trend that will occur. For example, if there are 4 bullish or bearish candlesticks that precede the doji, then the trend formed after the reversal will be very strong and tend to be long-term. Meanwhile, if there are only two bullish or bearish candlesticks that precede the doji, then the trend that will occur tends to be short-term. Because the doji's body shape is too small, you might have trouble recognizing whether the doji is bullish or bearish. This can actually be seen from the color of the doji itself. In the example above, a green doji indicates a "call" signal, while a red doji indicates a "put" signal. This strategy can be applied from the emergence of all kinds of doji forms. No matter whether the doji appears in the form of long-legged, dragonfly, gravestone, or four price, the use of all kinds of doji is still relevant for this strategy. Not only doji, hanging man or shooting star patterns can also be used as a marker for reversal trends in this strategy. This is because, the appearance of candlestick patterns with a short body and one long shadow has generally been known as a reversal marker. 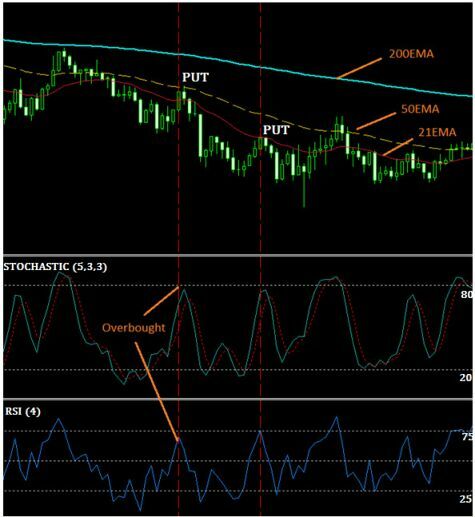 Trend indicator in the form of MA line (Moving Average) is almost always the main choice to observe trends from price movements. Here, traders usually combine MA lines with certain period variations to be able to do position entries, when the lines intersect. Not only that, trading signal confirmation from the oscillator is also always considered so that the trading position becomes more convincing. The "call" option can be placed if the price is above the 50 and 200 EMA lines, and touches the oversold level on the oscillator chart. The "put" option can be selected if the price is below the 50 and 200 EMA lines, and touches the overbought level on the oscillator chart. In the picture above, the "put" option is very suitable to set after the price reaches the overbought level. 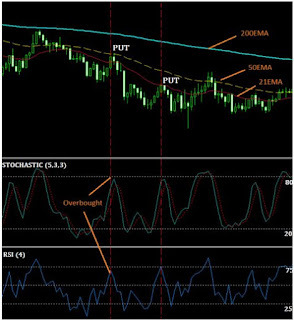 When the price position is still below the 50 and 200 EMA lines, the selection of the "put" option will make trading 15 minutes of your binary options end in-the-money. The emergence of 2 trading opportunities from the same situation in the graph above also helps prove the consistency of the success of this strategy. For those of you who are beginners, the risk of using this strategy can be reduced by actually ensuring the formation of candlesticks after the overbought or oversold levels are touched. In the example above, you can ensure the formation of a new downtrend by looking at the graph at a 5 minute time frame. If at the time frame the bearish trend has begun to appear, then the trading signal for the "put" option will be more validated. If you are already skilled at trading binary options, you can combine this method with fundamental analysis and price action strategies. Using support and resistance levels will also help you further to confirm trading opportunities from this strategy. This method will save time, because you don't have to wait for the formation of a new trend at a lower time frame. For binary options, trading with 15 minutes of expiry time cannot be categorized as short-term trading, but it is also inappropriate when classified as long-term trading. It really doesn't need to be disputed, because you can take advantage of this condition to be able to achieve profit in a relatively short period of time more calmly. It is said to be quieter, because when compared to trading 60 seconds or 5 minutes binary options, this 15-minute strategy is indeed safer than noise and fake trading signals are found mostly from price movements at lower time frames. Besides that, you don't need to analyze the formation of long-term trends to estimate the next price movement. In the strategies that have been shown before, you can immediately place the option according to the candlestick pattern or the price position of the trend indicator at the 15 minute time frame. Although it won't appear at any time, these methods can be a promising choice of binary options trading strategies if you can take advantage of the emergence of those patterns correctly. It can also prevent you from unplanned scalping techniques, which is generally done by re-placing the option after expiry time from the previous option runs out. Small movements at a 15 minute time frame can also be maximized to get promising profits. As in the example strategy in this article, you only need to wait for the formation of one candlestick to actually install options after the doji pattern is formed. Confirmation of a strategy that relies on a trend indicator also does not need to wait for a few candlesticks, because analysis at a lower time frame will help you ensure trends that occur after overbought or oversold levels are touched. If you want to get a promising profit return in a short time, but hesitate to develop a 60 second and 5 minute strategy on your trading binary options, this 15 minute strategy can be a promising trading option. Because it has trading analysis that can be applied with or without technical indicators, this method can be managed by all traders, both new and those who already have a lot of experience. However, you are still encouraged to set a risk limit on each of your option positions. The amount of capital that you specify must be balanced with the condition of your trading account. The maximum use of 1.5% of the overall trading capital will help you maintain the health of a trading account. Money management calculation should be done seriously, considering that the option that ends out-of-the-money will actually endanger the capital you use. This is certainly relative to those of you who have gained a lot of experience in binary options trading. Therefore, if you are a beginner, immediately increase your strategy and trading experience to be able to increase profit returns more convincingly.